Naruto wallpaper featuring Gaara and his teammates, again, with scans from the manga colored by PaintPixel. Hope you guys like it! Hm... i like your wallpaper style. Very interesting. Maybe this is your best wall i've ever seen. Keep your good work. That is really cool! Love that scan and the way you put the others into the sign there. Thats totaly awsome! 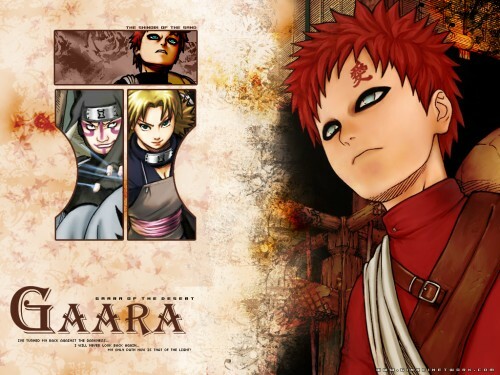 Ya, finally, haven't see a gaara wall..well the sand ninjas too..but anyways nice job, the scan was extracted good. wow, a really nice wallpaper you made there! keep up the good work! Hey!!! good idea with the sand's symbol and these pictures. Hey! Great job! I love Gaara! He is one of my fav! This is a really good wallpaper of "the shinobi of the Sand". Gaara stands out a lot, but looks good, great scan. The bg behind him is well chosen. Really like the idea you had for the Sand emblem, splitted into 3, each representing the mean chars in the anime. This is great, I like how you used the sand symbol, that was very creative. The background is nice too, not exactly simple but not too flashy. Cool. The whole concept is really cool. I'm feelin' the sand symbol. This is nice. +Fav. Very very very very nice wallpaper. I only don't like the way Gaara's colored, but in general the pic is very good. this is awesome! i love it! the pot idea w/ gaara and his team is soooo cool and i love gaara! this is just sooo cool! nice work!